and/or competent++ individuals committed to achieving and maintaining lead positions on the cutting edge of graphically, mathematically, and socially intense interactive technologies. Or perhaps you'd like something simpler...? I can do that too! PHP and MYSQL database-driven websites and applications all lie somewhere in the middle, and this is where I'm focusing my code writing endeavors at present — creating interactive, membership-based websites for businesses, organizations and communities. Penultimately proficient purveyor of poetry, punnery, and other perspicuous pap, pondering possibility of position permitting periodic penning of prosody. Singer, songwriter, and sax player* — a groovy cat who can hammer out jingles like there's no tomorrow — keeping an ear to the ground for a swinging multimedia team that is ready to jam! Can you dig it? *also not-half-bad on rhythm guitar! 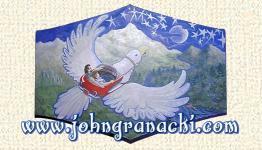 Top-notch analyst and researcher with a formidable knowledge base and an unparalleled learning-curve seeking academically stimulating high-end adventure. I question answers as well as answer questions. If the solution you seek is not already lurking within my profusely crenellated cerebellum, then it's probably no more than a phone call, a Google search, or a trip to the library away — and no one can find it faster than I. If you're looking for spin, the Doctor is in! 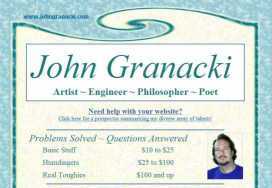 John Granacki "bakes from scratch"
www.rogueplanet.net is my flagship endeavor in the art of online community building. If you're local to Southern Oregon, especially around Grants Pass, and even more especially if you're an artist, an art lover, or a downtown merchant who really gets into First Friday Art Night, then you really should sign up for a free passport, which comes with all kinds of online goodies to promote your art, your art business, your business arts, or just yourself! 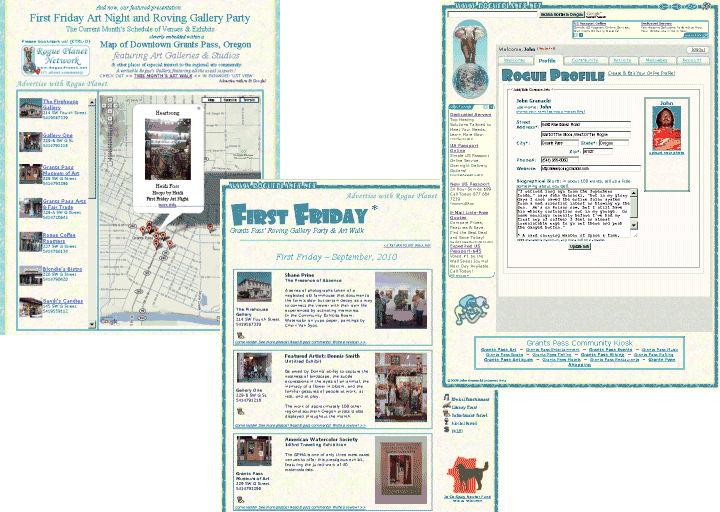 The Rogue Planet Network has been reporting on our local Art Walk(s) and other aspects of the burgeoning Grants Pass & Southern Oregon Arts Movements since 1996 (hit & miss prior to 2002 but fairly steadily ever since...) This site is Google's #1 hit for FIRST FRIDAY ART NIGHT (against an enormous field of global competition! Did I mention that I'm good?) and has been for several years. Unless I leave Southern Oregon this is unlikely to change, so perhaps Ashlanders should sign up too. Come on! Let's keep rocking the Art World and let everyone know that it's still centered right here! Of course everything can't be all about art, and we're looking for a few good Fishermen too! And Gardeners, Gold-panners, Hikers and Historians; Musicians and Magicians; Barbecue Virtuosos and Beauty Queens (pretty please?) 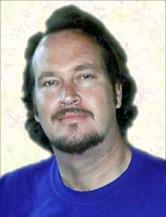 Authors and Antiquarians; Princesses and Poets! Oh, what the heck. Princes and fisherwomen are welcome too (beauty kings will be politely referred to that other website...) The only thing that I try to insist on is that all registered Rogue Planet Passport holders be local, even if only at heart. Certainly former locals are eligible, even if their residencies aren't current; that's why we call it a Passport. At the Rogue Planet you're welcome back any time, but if you're going to participate in any interactive features then we'd like to know who you are.